EXFO’s recently unveiled FTB-8830NGE Power Blazer module is an ideal test tool for next-generation converged networks thanks to testing capabilities that extend to Ethernet, SONET/SDH, OTN, Fibre Channel as well as packet synchronisation (SyncE/1588 PTP) services. The device is equipped to execute turn-up, validation and troubleshooting tasks on modern converged networks. As for packet-based Ethernet services, its unique dual test-set topology enables quick and accurate asymmetrical service level agreement (SLA) validation. These capabilities, combined with the EtherSAM (Y.1564) and SyncE/1588PTP test suites, make the Power Blazer well suited for ensuring peak network performance. It also addresses the needs for the turn-up and validation of Fibre Channel circuits at all rates (1x, 2x, 4x, 8x, 10x and 16x). 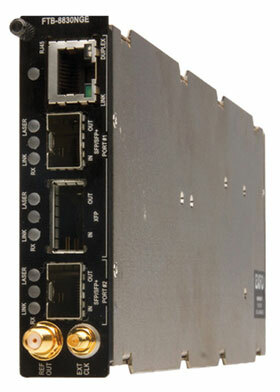 Furthermore, with two built-in 10G ports and a sleek design, the FTB-8830NGE offers high port density. When housed in the new FTB-2 Pro compact platform, the number of 10G ports can be expanded up to four simultaneous tests per compact platform.